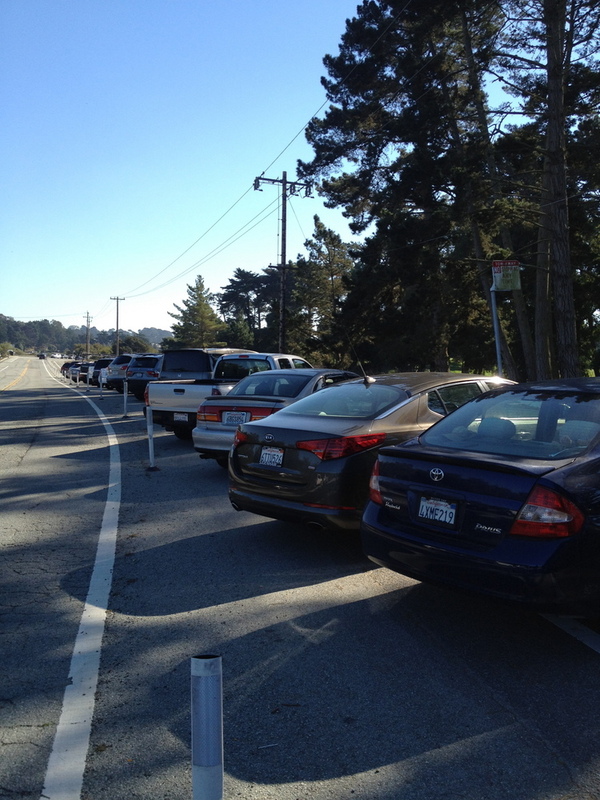 A buffered, post-separated bike lane on John Muir Drive along Lake Merced was commandeered for car parking this weekend for attendees of a golf tournament. Staff from the “Champion’s Tour” Charles Schwab Cup Championship were directing drivers to treat the bike lane as an angled parking lane. Attendees and passersby using the bike lane for its intended purpose were apparently left with no other choice but to merge into 40 mph traffic or get off their bikes and cross over to the shared bike/pedestrian path. Jan Peña sent in photos of the scene, which show a stretch of empty, legal parallel parking spaces on the other side of the street. The tour’s website makes no mention of parking along John Muir and directs driving attendees to park at the Stonestown Galleria and take a free shuttle to the event. Did you ask the SFMTA for comment. I understand they received complaints about these cars. The only way to stop San Francisco’s scofflaw motorists from stealing bicyclists’ right of way and eliminating all the intended safety benefits of bike lanes is to employ hard, impermeable physical barriers capable of severely damaging errant automobiles. 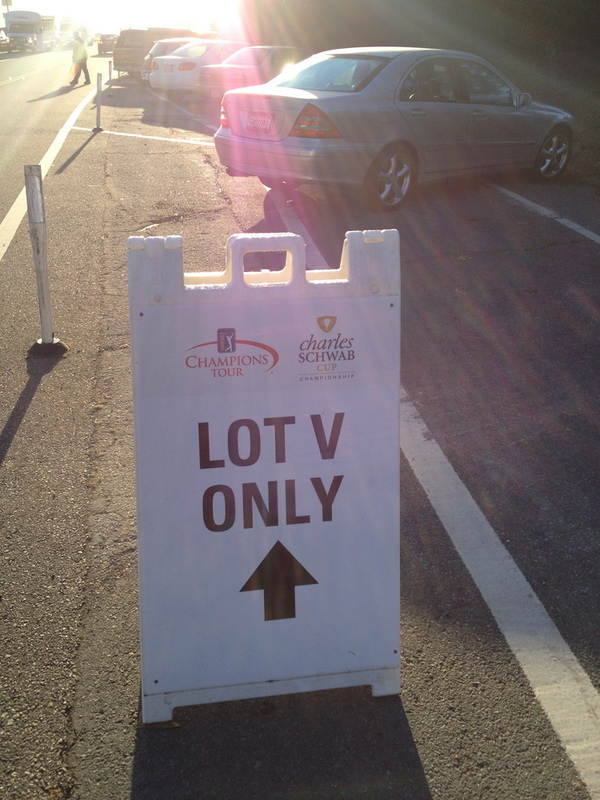 The golf tournament organizers are auto chauvinists. 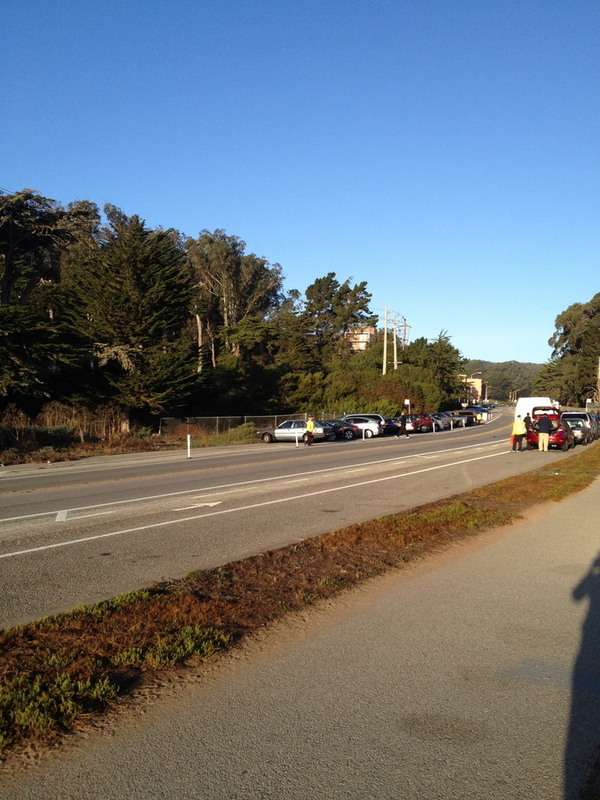 Count the number of illegally parked cars and fine the golf tournament organizers for each. If they charged attendees for this parking, demand it be refunded or paid to the city. Then assign a full time PCO next year and demand payment for that officer’s overtime. In theory this is illegal and those cars should be ticketed. I wonder what would happen if you called a PCO? This happens every Tuesday and Thursday night in Windsor California for the farmer’s market/family festival (movies on the green/etc…). The city does direct people to park at the High School where there is a shuttle, but I also saw a “crossing guard” of sorts helping people parking in the bike lane on Old Redwood Highway across the (40 MPH speed limit) road. I would encounter 1/2 mile or more where the bike lane was completely obstructed, requiring me to take the lane in front of traffic coming at me at 40 MPH. At dusk. Windsor is a LAB Bronze Level Bike Friendly Community. They will be getting a visit from me before next season’s events. Buffered bike lanes are a tow-away location. It would have taken some time for DPT to dispatch someone out there, although I bet there was at least one SFPD officer and at least one DPT PCO duplicating efforts as usual “doing traffic management” nearby. The PCO would have to verify there is a violation before dispatching tow trucks to the scene. By the time a tow truck would have gotten out there, the owners would have been notified and the cars moved. PCOs will usually give a chance for the owners to move the car, but will cite once on scene. I’m curious, are there in general any laws to fine the organizers of events rather than the drivers? They are the ones acting in the worst faith here, and should be taking responsibility. It seems pretty common in SF that business direct people to park illegally and are never punished (or even scolded) for it. Downtown hotels in particular seem to encourage queues in the street. I remember that the Gold Club used to cone off the bike lane on 2nd Street; I once got doored by a double parked limo driver there. Join the party. Remember, “streets are not free”. Anybody can rent one for a day. It’s fine if they paid for it. When I moved to SF I paid ~$138 to get space for the truck full of our stuff. I don’t mind a local photo/event venue taking up most of the street, now that they pay for it (instead of just putting out the same signs with new dates)…I really didn’t even complain much when my car got towed because some yahoo ran off with 1/2 a blocks worth of they legally posted signs. Sounds like the PCOs should instead be issuing tickets. Besides safety this is one of the other biggest reasons to favor cycletracks with impenetrable barriers (or enough physical separation/its own grade as is often done in the Netherlands). Even more common than massively egregious displays such as this is the daily and very prevalent injustice of double parking in Class II bike lanes, which I know has been reported on here before. I don’t think I’ve ever ridden down a route such as Valencia without coming across at least 1-2 double parkers at any given time. Btw, one thing I don’t quite get about city policy is in locations like Lake Merced why not just upgrade/expand the current bike/ped path around the lake to become a two-way cycletrack + separate ped sidewalk? Out of all places there’s definitely the room for it there and a continuous two-way cycletrack would create a more seamless ride around the lake as well as integrate more easily with the other important bike junctions (Sunset, Brotherhood, Font/SFSU, Winston, etc) which the Lake Merced bike loop touches. Perhaps it is still seen more as a recreational route but as I live just east of SFSU I use a part of Lake Merced loop several times a week as a connector to the path up Sunset->GG Park. It’s one of the more unsung north-south separated bike routes in the city and some infrastructure upgrades such as two-way cycletracks+separate ped paths to the Lake Merced->Sunset paths themselves (rather than bothering with subpar Class II-ish bike lanes on the adjacent streets like John Muir) could really help. but if we apply this logic, then why did they not close down the entire street? This was a case of “Oh, I don’t take a certain percentage of the population seriously, and I don’t think they deserve safety.” These are two different circumstances.